Monalisa Perez was charged with manslaughter after she accidentally shot Pedro Ruiz in the chest while making a YouTube video for the couple’s vlog. Monalisa Perez was arrested Monday night after she fatally shot her 22-year-old boyfriend, Pedro Ruiz, while the couple was recording a YouTube stunt for her vlog, according to a criminal complaint provided to BuzzFeed News. On Wednesday, she was charged with manslaughter in the second degree, a felony that carries a maximum sentence of 10 years or a fine of $20,000 or both. She was held in a regional jail in Crookston and was scheduled to be arraigned in court Wednesday afternoon. Perez called 911 on Monday evening to report that she accidentally shot Ruiz in the chest while they were making a YouTube video at the couple's house in Norman County. Authorities found Ruiz III with a single gunshot wound to his chest and attempted to save his life, but he died at the scene, the complaint said. Perez, who is pregnant, told police that Ruiz wanted to make a YouTube video of her shooting a book while he was holding it, as he believed that the book would stop the bullet, according to the criminal complaint. 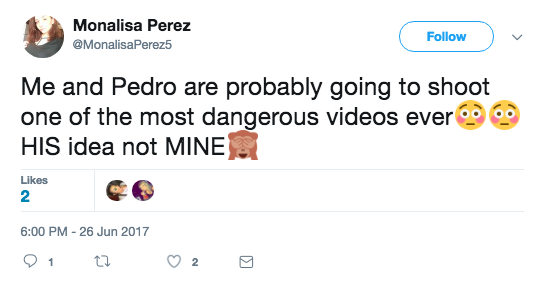 Perez tweeted on Monday that the pair were planning to shoot a dangerous video. “HIS idea not MINE,” she wrote.